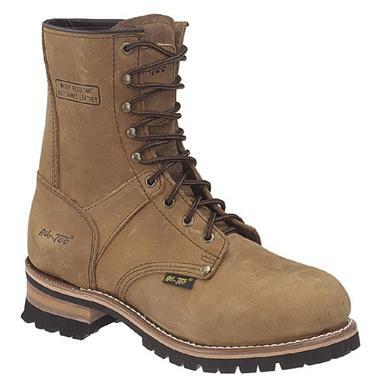 High-quality Logger Boots, ready to make chainsaw art out of your work day! The Crazy Horse leather is deeply oiled for water resistance—water beads up and rolls right off. Goodyear welt construction makes them flexible, supportive, and easily repairable when the outsole begins to wear. Work-ready, wallet-friendly. Flannel, beard and blue ox not included.